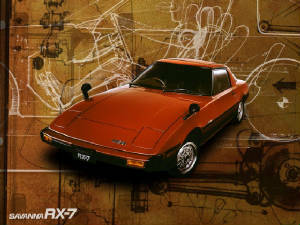 Looking back to 1978, it is almost impossible to believe that the original Mazda RX-7 (codenamed X605) could have been so good. Perhaps it's because true sports cars were thin upon the bitumen in that era. Certainly the assessment has something to do with the essential sportiness of the RX-7 coming as such a contrast to the upright and faintly flabby RX-5 which immediately preceded it. 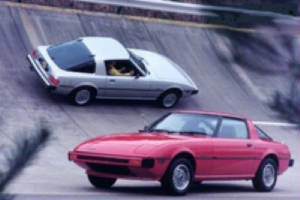 The RX-7 outperformed, outhandled and even out-braked the RX-5. But remember that the newer car was fitted with the 12A rather than the 13B rotary and emerged from Hiroshima with drum brakes on the rear instead of the four-wheel disc arrangement of the RX-5. Within a few years all RX-7s were equipped with disc brakes all round. Figures alone cannot convey any of the car's charisma, even though a standing 400 metres time in the low 17 second bracket was exciting enough in the Australian context. Consider, for example, that the 4.2 litre V8 Hoiden Commodore could manage a best of 17.4 when equipped with its standard (and primitive, though beefy) four-speed manual transmission. Top speed was about 195 km/h with an even 200 achievable with only a little assistance from wind or gradient. The Commodore, however, was all out by 180 km/h. To what extent was the RX-7 an RX-3 lurking within a sleeker body? The answer is: very little. Certainly the 12A was still used, as was recirculating ball steering and a disc/drum brake combination. But the development and refinement given to all these components made any resemblance between an RX-7 and a 12A RX-3 faint at best. Obviously the much lower centre of gravity, the wider track, the far more sophisticated rear suspension, the wider wheels and better tyres combined to transform the overall handling of the car. An RX-3 was average 1970's Japanese sedan in its dynamics, while the RX-7, which was derived from the RX-3, was markedly better than practically any 1979 competitor - whether from Japan, Australia, the US or Europe - and arguably superior to the Porsche 924. But as well as making the rotary sports car agile and balanced, the engineers had built far greater feel and precision into the steering. A broader steering shaft reduced distortion with obvious benefits in the area of steering sensitivity and feel. In a sense the most remarkable single aspect of the RX-7 was that it was as good as it was despite some quite simple engineering. Along with recirculating ball steering came drum brakes and a live rear axle. Here was a triumph of refinement over revolution, of painstaking attention to detail and of sheer determination to make the first rotary-powered sports car since the original Cosmo, right. It didn't matter that the rear suspension wasn't independent because it was about the next best thing. The live axle was located by a Watts Linkage. Coil springs, gas-filled Kayaba dampers and an 18 mm roll bar were the other key items. The chassis engineers had chosen the Watts Linkage over a Panhard rod for three main reasons. Firstly, it had been used on factory-sponsored RX-3 racers in Japan. Secondly, it provided a more favourable roll centre. Thirdly, if a Panhard rod had been used the car would have had to be some 75 mm longer. 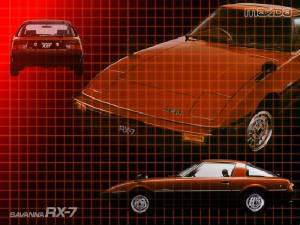 Dimensionally, the Mazda RX-7 was somewhere between an RX-3 and RX-2 in overall length. At 4285mm, it was somewhat longer than an MGB and significantly bigger than Fiat's X1/9. With a width of 1650mm and a height of just 1260mm and riding on 5.5 inch alloy wheels, the RX-7 had a more crouched, muscular stance than any other Mazda. At 1065kg it was a solid little sports coupe. The cars exported to the US were strict two-seaters but all the RX-7's sold in Australia were equipped with a small folding rear seat like their counterparts on the domestic Japanese market. From October 1979, all versions of the RX-7 were produced with a superior grade of interior trim, but the big changes came the following year. A revised front end treatment with a combined bumper/air dam arrangement lowered the drag factor to 0.34, which the calculator team at Mazda headquarters equated to five horsepower. Changes to the rear styling ran to neater lights and a tidying up of the number plate housing. Mechanically, the big news was the fitment of rear disc brakes to the upmarket GSL model (the model sold in Australia), along with superior fuel economy thanks to fitment of a catalytic converter in place of the thermal reactor. A thinner roll bar reduced oversteer through tight corners taken with too much speed and Bridgestone's grippier RD204 radials replaced the previous RD116s. In Australia the upgraded new version was known as the Series II. This immediately made the previous car the Series 1, even though no manufacturer has ever officially called a new car the Series 1. October 1983 brought the P132 series. US buyers scored the 13B engine with a Dynamic Effect intake system, Six Port induction and electronic fuel injection. Japanese customers could choose a turbocharged 12A version. It seems that management was wary about exporting this model just in case it gave problems. The reputation of the rotary for reliability and durability had been hard won over the previous decade and nobody wanted to risk squandering it. When the P132 reached Australia we called it the Series Ill. The naturally aspirated 12A remained the sole engine, the car being offered with neither the injected 13B engine nor the turbocharged 12A. At least Australian buyers got the new option of power steering (standard on the Limited, introduced with Series 3), the 14 inch wheels and the significantly revised interior with three-spoke steering wheel in front of a new instrument panel and improved controls. 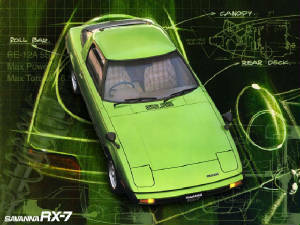 The RX-7 Limited was plush in a way that was at odds with its basic character. Two-tone paintwork, rather ritzy trim, electric windows and air-conditioning moved the car closer to the 280ZX/300ZX market. They also weighed it down. 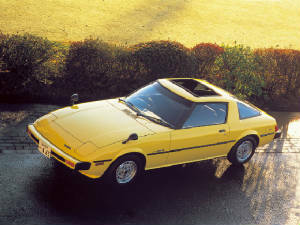 But the manual Limited (this time around the optional automatic transmission boasted an overdriven fourth ratio) was capable of running the standing 400 metres in 17 seconds flat - slower than the Mitsubishi Starion Turbo and the Alfa GTV6, but equal to the V6-powered 300ZX, which was an all?new design. The Limited was introduced with a pricetag of $23,120, which was cheaper than the last of the 280ZXs ($26,100) and almost a full five grand short of the 300ZX ($28,000). The Alfa GTV6 commanded $29,500 and the Starion around $24,000. Quick as the RX-7 was, the chassis cried out for more power (although the appearance was still not looking too dated half a decade down the road). But Australian buyers would have to wait for the second generation car. Expectations would be high with the original having established itself as a modern classic within its own lifetime. Mazda formally started the project in 1976 when it was called X605. The first prototype was completed in 1977. It was introduced to America as a 79 model on April 24, 1978 since production began in March. A slogan Mazda used was "It's the real thing. A sports car with all the traditional virtues and then some." One magazine's headline was "The Rotary Revolution has begun". Thus began Mazda's passion for pure sport cars that has continued through three generations and includes the Miata and RX-01. The 12A engine (2 x 573 = 1146 cc) had two side intake ports and one peripheral exhaust port per rotor. There was a thermal reactor. Transmissions were four and five speed manual and three speed auto. American models were two seaters only, though a 2+2 was offered in Japan due to relaxed crash standards. The P designates "production". Upgraded interior materials. Production changed October, 1979. It appeared in August 1980. The rear and tail lights were redesigned eliminating the "Baroque depression". Front bumper, air dam changed. The Japanese variant had rotor inspired aluminum wheels. This began in 1980 (part of P815 run) as the "Leather Sport", 2500 units, and became the GSL in 1981. In Canada, this was known as the GX. In 1981 they were restyled, most visibly in the rear. A stop-gap version appeared in July 1982, the P130, with an improved engine for better fuel economy. A high output audio system was an option. It was called "Black Dynamite". The SE saw the re-introduction of the 13B engine, last seen in the 1978 RX-4, but now rated at 135 bhp because of Dynamic Effect Intake (DEI), six port induction (2 by 3), and electronic fuel injection. 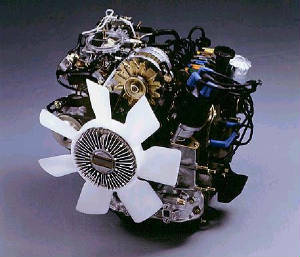 In Japan, there was a P132 with a 12A turbocharged engine. Power steering was offered for the first time. 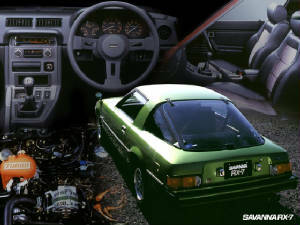 The interior was upgraded, but this did not appear in the Japanese turbo version.